The EM-Tec M1 and M-10 calibration standards both have a square mesh type grid pattern etched in the surface of an ultra-flat Si substrate. 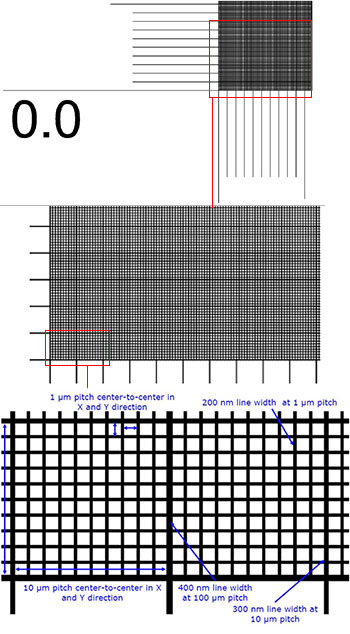 The grid patterns are practical tools for magnification calibration and image distortion assessments. Intended for use with SEM, FESEM, FIB, Auger, SIMS and reflected light microscopy applications. The specimens can also be mounted directly on the pattern; in this case the pattern in the background will give a direct calibration within the image. This is especially useful when working with small samples and powders. The EM-Tec M1 and M-10 grid pattern calibration standards are supplied with a wafer level certificate of traceability to NIST. The EM-Tec M-1 has a grid pattern with a pitch of 1 µm and lines at 1, 10 and 100µm. Useful for calibration and image distortion checks in the 100x to 10,000x magnification range. Alternatively, the samples can be placed directly on the grid pattern for immediate calibration or internal calibration in the image. This is particularly useful for small samples. The lines are etched directly into the ultra flat Si substrate which will give superior signal strength compared to SiO2 etched structures. The EM-Tec M-10 has a grid pattern with a pitch of 10 µm and lines at 10 and 100µm. 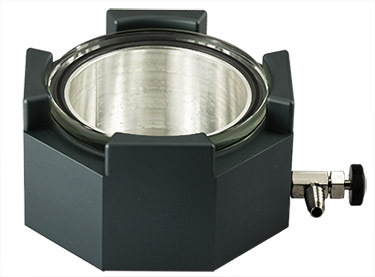 Useful for calibration and image distortion check in the 100x to 1000x magnification range. Samples can also be placed directly on the grid pattern for direct calibration or internal calibration in the image. This is practical for small samples. The lines are etched directly into the ultra flat Si substrate which will give superior signal compared to SiO2 etched structures. EM-Tec M-1 with a 1µm pitch grid pattern is useful for calibration or image distortion asessments in the 100x to 10,000x magnification range. Pattern size is 3x3mm with lines directly etched in a conductive ultra-flat silicon substrate. Lines are 300nm deep with a width of 200nm for 1µm lines, 300nm for 10µm lines and 400nm for 100µm lines. Alternatively, small samples can be placed direction on the grid pattern for immediate calibration or integrated calibration in the image. This standard is NIST traceable; example of wafer level certificate of traceability for the Em-Tec M-1 grid pattern calibration standard. EM-Tec M-10 with a 10µm pitch grid pattern is useful for calibration or image distortion assessments in the 100x to 1000x magnification range. Pattern size is 3x3mm with lines directly etched in a conductive ultra-flat silicon substrate. Lines are 300nm deep with a width of 300nm for 10µm lines and 400nm for 100µm lines. 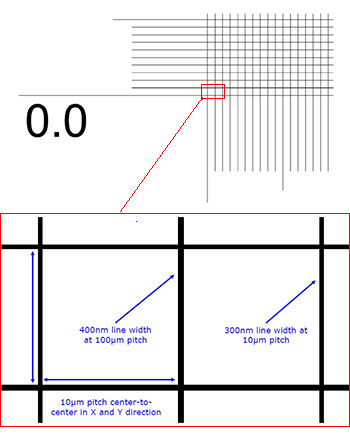 Alternatively, small samples can be placed direction on the grid pattern for immediate calibration or integrated calibration in the image. This standard is NIST traceable; example of wafer level certificate of traceability for the Em-Tec M-10 grid pattern calibration standard. Intended for SEM, table top SEM, FIB, Auger, SIMS and reflected light microscopy.